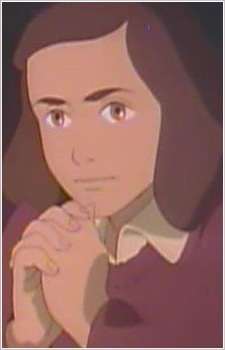 This is the anime representation of the Jewish person of the same name, who is famous for the recording of her life in hiding during the Holocaust in a diary, to which she affectionally named 'Kitty'. Acknowledged for the quality of her writing, her diary has become one of the world's most widely read books, and has been the basis for several plays and films. Anne succumbed to typhoid in the Bergen-Belsen camp in March 1943.